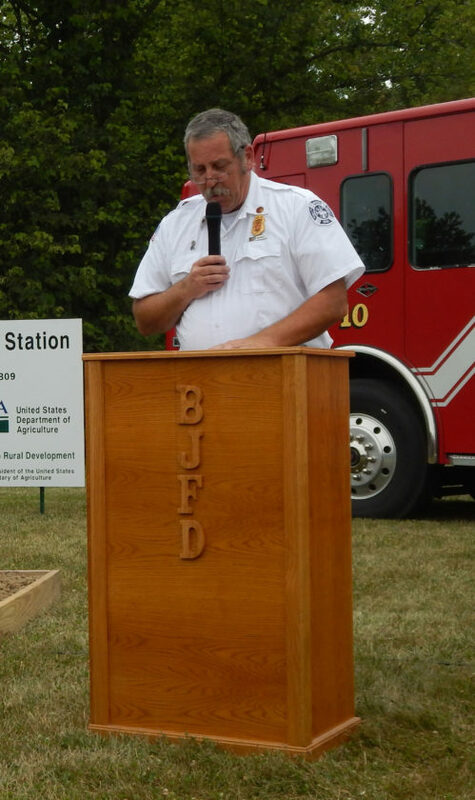 PHOTO BY JACOB GURNEY Chief Mark DeVault of Bascom Joint Fire District speaks during the Bascom Fire and EMS Main Station Groundbreaking Ceremony at 5450 W. Tiffin St. Saturday afternoon. BASCOM — People gathered to witness the groundbreaking of Bascom Joint Fire District’s new fire station at 5450 W. Tiffin St. Friday afternoon. 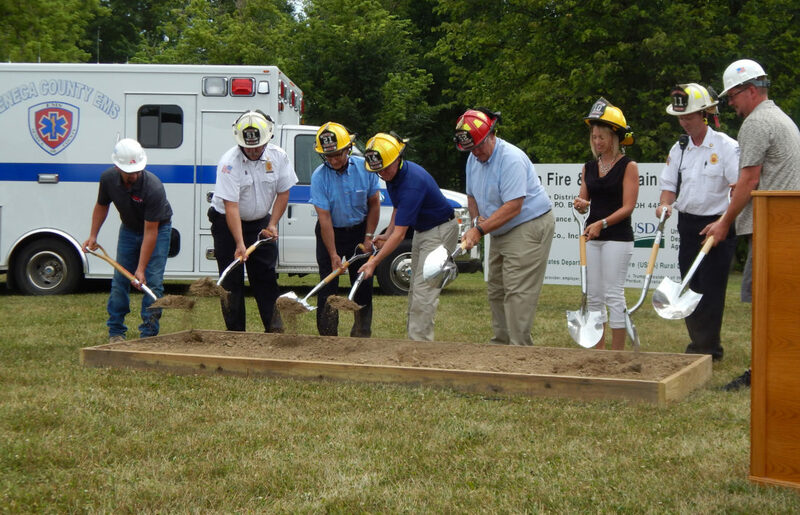 Six groups of people took turns “turning the soil” as part of the ceremony, including government officials, fire board members and Bascom Joint Fire District and EMS personnel. Chief Mark DeVault of Bascom Joint Fire District started off the ceremony by thanking State Rep. Bill Reineke, R-Tiffin; Seneca County commissioners Mike Kershner and Holly Stacy; Loudon Township Trustee Jason Painter; Hopewell Township Trustees Jim Clouse and Lorrie Zoeller; and the Bascom Joint Fire District Board consisting of Roger Holman, Richard Gosche, Troy Huth and Victoria Coppus, for attending. After Pastor Dean Durant of Bascom United Methodist Church led the consecration/dedication, DeVault welcomed those in attendance and said a foundation usually is a stone or concrete structure that supports a building from underneath. PHOTO BY JACOB GURNEY Members of Bascom Joint Fire District Board, Bascom Joint Fire District and the construction and design team turn the soil during the Bascom Fire and EMS Main Station Groundbreaking Ceremony at 5450 W. Tiffin St. Saturday afternoon. “There was a need for a fire department and you, the community, formed the fire department. There was a need for volunteer firefighters and you, the community, provided firefighters. You, the community, voted and passed our levy. You send cards of thanks and support our festival. You, the community, express your gratitude, convey your condolences and offer to help us when we are supposed to be helping you,” he said. DeVault said the community has given a great foundation to build upon for the fire department, which has been in place since 1927 and still is “going strong.” He said it is a foundation they are proud to serve from. President Roger Holman of Bascom Joint Fire District Board said the day was an exciting because it was one where “a dream was starting to become a reality.” He thanked voters for passing the levy which allowed for the station to move forward. 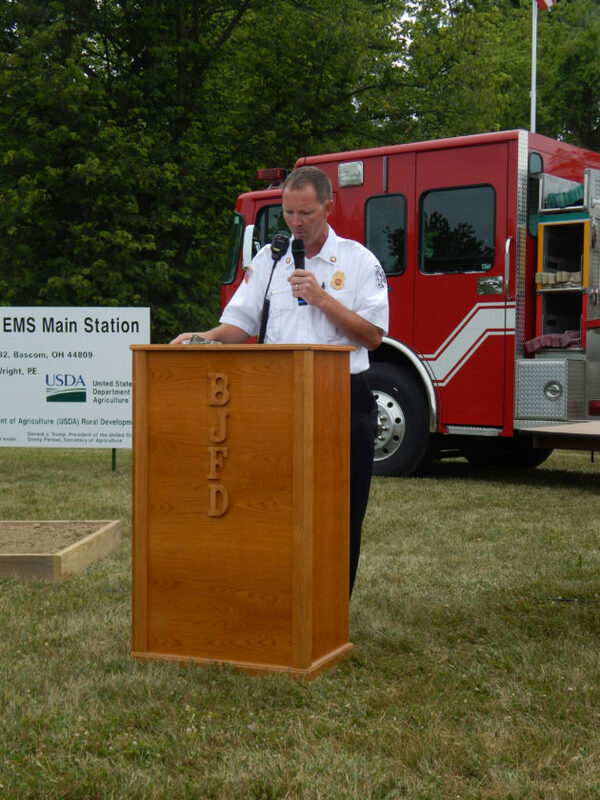 PHOTO BY JACOB GURNEY Assistant Chief Chris Daniel of Bascom Joint Fire District speaks during the Bascom Fire and EMS Main Station Groundbreaking Ceremony at 5450 W. Tiffin St. Saturday afternoon. Holman also thanked the Bascom Fire Ladies Auxiliary for all they do to support the departments and recognized to the spouses, children and families of the firefighters and EMTs because they have made sacrifices to serve protect the community. “I just would like to thank everyone, thank the firefighters and EMTs especially, and it’ll be exciting to watch this building go up,” Holman said. Daniel, who also is the building chairperson, quoted U.S. President Dwight D. Eisenhower who said “Plans are worthless, planning is priceless.” He said that according to historians, Eisenhower meant that while you make plans to reach a goal, seldom do they work out as originally established; the planning allows you to work through the multiple obstacles without losing focus on the goal. “As a fire department, this whole quote holds true in many of the calls we respond to throughout the year,” Daniel said. He said as they started to look at the possibility of a new main station, their “plan,” was presented to the fire board along with many of the details laid out from outreach, funding, size of the facility, possible locations and potential needs. Daniel said the process started with a simple survey given to fire and EMS personnel and from there, they formed the core committee that met to discuss and provide feedback through the planning process, which included having many meetings and touring many stations. They then came up with a basic plan of requirements for the new facility, he said. “Up to this point, all went as planned, but much has been adjusted to the plan from this point on forward,” he said. A program of the event states the new Bascom Fire and EMS Main Station is to have 11,500 square feet of floor space with seven truck bays and two EMS bays. It also is to have a responder dorm area, integrated training and parking for more than 50 vehicles, the information states. It also is to have a radio room and offices to meet today’s needs. Daniel said originally the old school land was talked about for the location, but after some discussion, the property that they are to now build on became available and it provides a “better, safer location.” After that they moved forward with bringing Terrence Wright on board as the design professional, he said. “He has helped us through many of the obstacles we’ve encountered along the way while allowing much input from the fire and EMS personnel,” Daniel said. Then, they worked on gathering information from the community on how to present the levy to the public and while they were going to put a levy just for the facility, they realized it was time to address the operations funding as well, he said. A 2.5-mill replacement levy was placed on the ballot to take the place of the original 1.8-mill levy that was passed in 1998, Daniel said. “The community answered the call with a 80-percent passage,” he said. “With the passage of the levy, we knew the dream of having a new station was going to become a reality. The plans were drawn and amended multiple times, but the basic layout remained,” Daniel said. Daniel said they needed to address the long-term bond to provide the funding for the facility and they had talked with the U.S. Department of Agriculture as well as other banking institutions to provide the terms they could afford. While the USDA required many steps in the lending process, it was to save them more than $400,000 over the lifespan of the loan, Daniel said. After completing the necessary steps required, they were notified there was $2,047,000 allocated for the project, he said. Daniel said they were finally to the part of selecting the construction manager as constructor, which also took many steps to navigate. The process identified a local contractor in their fire district, Alvada Construction Inc., as the right fit for the project. He said he thinks about how the small Bascom community might look a year from now as someone passes through. After the turning of the soil, DeVault ended the ceremony by thanking everyone for coming out and reiterating the importance of the community. “There’s a new future in Bascom. Like I said, when you look at the station it’s the building, but you guys are the foundation and we thank you,” he said. Bascom Joint Fire District personnel were busy after the event as the department hosted its annual Bascom Firefighters Festival at Meadowbrook Park and at 4:47 p.m. crews responded to a report of a field fire at 1975 N. TR 101. Daniel said about 12 acres burned and no structures caught fire. Kansas Volunteer Fire Department assisted at the scene. “It was very warm out and we fortunately worked together. We had a good turn out of mitigating the call of extinguishing the fire,” Daniel said.